In talking with Larry Theobald, who owns and operates Cycle Italia cycling tours along with his wife Heather, I get the feeling that their trips definitely are unique from other tour companies. I first traveled with Larry and Heather on a trip to the 1994 Giro, when they were guiding for another well established cycling tour operator. Although both struck me as true blue Americans (the unmistakeable ‘twang’ in their voices never lies!) I was impressed when Heather conversed in what sounded like perfect Italian to a border guard as we crossed from France back into Italy. Given the boom and bust nature of the cycling travel industry, I was even more impressed when I discovered they now operate their own company called (not surprisingly) Cycle Italia. Started in 1998, the ten years running their own company is testament to the quality of their trips – that’s a lifetime in their industry. Obviously they’re doing it right, so I asked Larry to tell us more about what makes their cycling trips to Italy different. Larry: "Pedala forte, mangia bene!" is more than a cute slogan, it's our philosophy. 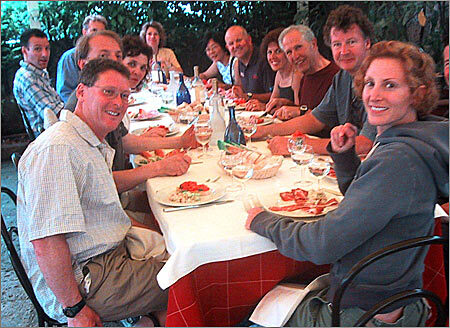 We created CycleItalia in 1998 to indulge our own passions of riding hard and eating well. We set out to combine authentic culture (which we define as genuine food and wine from the region we're visiting, combined with an appreciation and understanding of the local lifestyle) with challenging rides for avid cyclists. It all began during our work for another tour operator - on the open dinner nights, some clients would inquire as to where Heather & I would be dining after figuring out that we were quite interested in authentic, regional food and wine rather than a generic pizza/pasta/salad diet. During many of these dinners, the conversation would turn to, "why don't YOU start a tour company so we can come with you and eat like this every night?" In 1998 we decided to do just that. You and Heather have lots of experience leading tours all over Europe - so why did you choose to just focus on Italy? 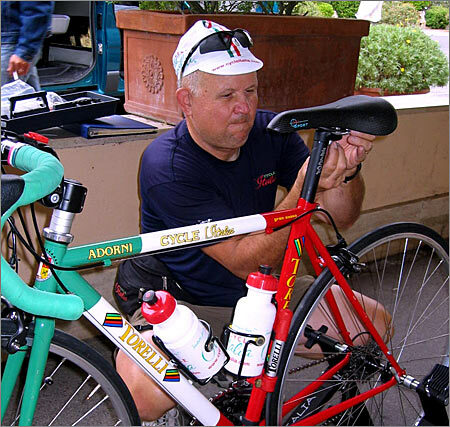 Larry: Before starting Cycle Italia, we spent over 10 years working with an operation that in many ways pioneered high-performance bike tours in France and Italy, beginning with following Greg LeMond at the Tour and Giro. During that time we grew to have a greater appreciation and understanding of cycling culture in Italy. It certainly helped that Heather has Italian relatives, in fact her father was born there. She also had connections with some journalists in Bergamo, one of the hotbeds of Italian cycling. My first visit to Italy was 1989 and I fell in love with Heather and Italy during that tour! Whenever we had a break from our duties with the other operation, we instantly hit the road towards Italy, even if it was just for a day or two. We found nothing to compare to the respect for cycling in Italy - both "cicloturismo" (just enjoying riding your bike) and professional sport. Add in the best food in the world for an active bike rider, there's no better place to be… When we eventually retire we're planning to move there permanently. After another fine meal… the smiles don’t lie. What are your favorite things about Italy that you make a point of sharing with your guests? Larry: Unlike the US, in almost every Italian knows something about cycling and we're continually amazed when we sit down at a bar or ristorante, how knowledgeable the average Italian is about cycling, both as a pro sport and enjoyable recreation. A lot of these folks raced at some level and you often hear from or about the guy who used to dust Cipollini back in their junior days. Everyone's mother rides a bike down to the market to get the fresh vegetables and groceries, and local pros are constantly out training on the roads - so every motorist is aware of cyclists on the road and gives them great respect. Who would want to be the one who ran over their friend's mother or the local pro? More likely, they'll roll down the window and yell "FORZA" as you struggle up the climb. Beyond the cycling, it's just the way of life there, a slower pace, much more concern about family, food and friends and a "hospitality gene" that doesn't exist anywhere else. 4. You don’t really build your trips around following big races like the Giro, why not? Larry: After many years following both the Giro and Tour we found most clients preferred riding their own bikes to watching others ride theirs. Don't get me wrong, as you well know there's nothing like seeing one of these big races live and in person (in fact we'll take a small group to see the 2008 LeTour stage finish in Pratonevoso), but most people want more emphasis on their own personal cycling, with great weather (something not guaranteed at the Giro in May, especially in the mountains) the best in food and wine along with charming lodgings each night. They also prefer a small group, (our max is 12) more like an extended family than a tour group. This way we can actually be part of the local ambience rather than creating our own atmosphere as foreigners or being part of a huge crowd… and our hotel and ristorante partners can extend courtesies to us that are simply not possible with large groups or during huge events. We visit the high mountains during July for our 4-week Legendary Climbs of the Giro Series. This period has wonderful weather and we're there before most of the summer tourists arrive so the roads are peaceful and the small towns not yet packed with vacationers. Heather shows off some local pasta.. the kind you can only ask for in Italian. How are you set up in Italy to support your tours? I’d imagine there’s a fair bit of work and preparation required before you meet the guests at the airport? Larry: We do a lot of work to prepare for each season. Our Italian HQ is about an hour from Milan's Malpensa airport, in the Monferrato wine-country. This is "home-base" for all of our northern Italian itineraries as well as a place to store all of our equipment, including our own personal bikes and our small rental fleet. Besides being a great cycling destination on its own (we offer a self-guided, fixed-base "Taste of Piedmont" itinerary here) it gives us great access via autostrada (avoiding the horrendous traffic near Milan) to most everywhere in northern Italy. We transfer what we need from here down to a temporary HQ in Rome for the early season tours. We start each season with a brand-new 9-passenger van and install our custom-made roof rack on top, adding a 5-passenger station wagon for groups of up to 12 clients. We always have a seat in a vehicle for everyone in case of bad weather, injury or sickness - or more often, to custom-tailor a ride route for our clients. Even though the trips are geared to experienced cyclists, Larry knows his way around a tool box and isn’t shy about stepping in to twist a wrench. Tell us about a particularly memorable day from one of your trips. Larry: We describe a typical day on our website's FAQ section, but one of our most memorable days was in our ‘Paradise in Piedmont’ tour, which, as the first tour we ever produced has become our "flagship" in a way. Back in 1999, we arrived at Castellania, the birthplace and final resting place of "Il Campionissimo" Fausto Coppi and his brother Serse, one morning with our small group. We had been there previously while mapping the route, preparing the elevation profiles, etc. but on those R & D tours we don't always have time to linger. This was our first visit with clients and we wanted to spend some time at Coppi’s famous tomb. While I was waiting for our clients to arrive, I noticed the door open to a small office nearby, poked my head in and asked if there was anyone there who could show us around? A smiling gentlemen replied "Ma certo" (Of course) and introduced himself as Piero Coppi, Mayor of Castellania and first-cousin of Fausto and Serse. After we chatted a while, our first cyclist arrived to be greeted by Coppi who then quickly muttered "Torno subito" (be right back) and disappeared, only to return with packages of cookies, a bottle of chilled Moscato wine, water and plastic cups to welcome our group. He explained how excited he was that we would bring groups of American cycling fans on a sort of pilgrimage to keep alive the memory of his famous cousin(s). Once everyone arrived and enjoyed his hospitality he began to show us around the site, explaining (while Heather translated) the reliquary, museum, and chapel while sharing stories about Coppi and his gregari, many of whom are still alive. Too soon it was time to go but Coppi inquired where would we be eating "pranzo" (lunch)? We replied we had a couple of places in mind but were waiting to see where most of the group was at lunchtime. After another "Torno subito" and a quick count of our group, Coppi vanished into his office, returning to explain that everything was set for our lunch... we would be dining with him at his favorite osteria, he said with a bit of twinkle in his eye! We followed his car, our mini-peloton slowing on the descents and straining to keep up on the climbs, down to a small village, where he stopped and introduced us to everyone around as his new American cycling friends and Coppi fans. We enjoyed a simple but wonderful lunch with animated conversation (and plenty of wine) and when it came time to settle our "conto" (bill) Coppi insisted on paying... not only for the two of us, but our entire group! We thanked Piero profusely and he made us promise to come back next year and to phone first, handing us a card with his personal cell-phone number on it. Now, each year we go back (phoning first!) and share with a new group of guests the history of "Il Campionissimo" and lunch with the Mayor--who to this day always insists on paying. What type of cyclist do your trips appeal to? Larry: Our clients are avid cyclists, many are ex-racers while some still pin on a number now and then. More than anything else they're looking for a total experience of "la dolce vita in bicicletta" rather than a training camp or competitive environment. The only competition we encourage is who can enjoy their vacation with us the most. We try to treat our clients as if they are (or are interested in becoming) connoisseurs (in Italian, cognoscenti) of high-quality food, wine and hotels in the same way they already know and understand the finer points of cycling. We don’t really cater to novice or beginner cyclists as there are already plenty of tour operators for these casual riders. Hotels: what types do you choose? Larry: We prefer 3-star, family owned and operated lodgings. Interestingly enough, many of our hotel partners have "moved up" into 4-star category since we've been working with them, but still with the attention to detail you rarely get in places not "under the eye of the owner" and the family. Since our groups are small we can choose small establishments that simply won't cater to large tour groups. In many of them we've become more like family than customers after visiting them every summer for almost 10 years. 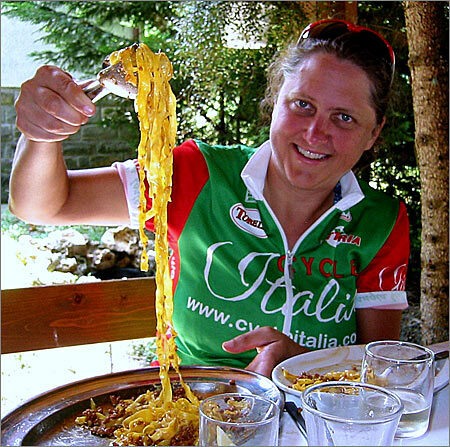 A lot of tour companies use the local food as an attraction for their trips, what’s different about dining with CycleItalia? Larry: Something we believe makes the CycleItalia experience truly unique is our emphasis on "mangia bene". There is no better way to get the best from an osteria or ristorante than to simply ask them to show us what they do best, and Heather is a master at doing just that. These folks truly have become our friends and our guests are welcomed each time as "friends of friends" rather than just a typical tourist. As a result, our group dinners are set menus though we're happy to change things to accommodate food allergies, vegetarians, etc. We also offer open nights for dinner so clients can do their own thing but I have to tell you, more often than not our guests want to join us at our favorite place - they know the meals will be wonderful, authentic, the ambience jovial and the price very reasonable. 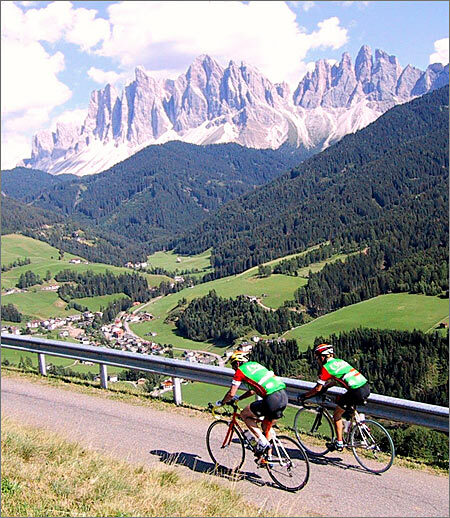 Pez Sez: Definitely worth a look for your next (or first) cycling trip to Italy – get more info at Cycle Italia.